Yoon holds both of my hands, and her defined eyes look straight into mine. We are sitting in a circle at the Han Race Remnant School, where a few other girls watch the two of us. For the girls, who have been living with Yoon at the school for several years, this may be a familiar scene. They learn, play and sleep at the school, while their parents work in various parts in Korea. A breeze from the coast of Incheon enters through a crack in the window, combing our hair. After saying a prayer, Yoon announces to me that from this moment, I am a Christian. The girls all clap for me. I remember telling her earlier in the day I believe in God, and I go to church once in a while. Yet, I do not disturb her while she proselytizes because Yoon looks joyful and alive telling me of the greatness of God. I do not want to let her down. God is a significant part of her life, Yoon says. Since her family’s escape from North Korea to South, He has been with her. Her mother took the lead, and five years have passed since she and her father arrived in Korea. Her brother followed his family’s path on his own. She does not share much else about her past in North Korea or her reminiscence of home. I am hesitant to ask because I sense my curiosity would cause her discomfort. We continue our conversations with lighter topics that connect us, chatting about skin-brightening cosmetic products and who we think will win the Korean version of American Idol. Her knowledge of Korean celebrities and trends matches mine, and she passionately voices her opinions about them. Her similarity with the rest of us puts me at ease. Six years have passed since my encounter with Yoon at the Han Race Remnant School. At the time, my motivation was the pursuit of an extracurricular activity, but my passion for refugee and immigrant rights matured since the visit. As I write this story, I recall her bubbly personality, charming countenance and rapport with her peers. I also remember forming the impression that she is similar to an ordinary teenage girl in South Korea. Then, I also reflect on the stories Yoon never told me about: the person she was back home, her journey across the river and struggles in Korea. The lapse in my knowledge about her reminds me of the stories I used to hide from others when I first came to America. On the day of freshman orientation at Miss Porter’s School, 2010. 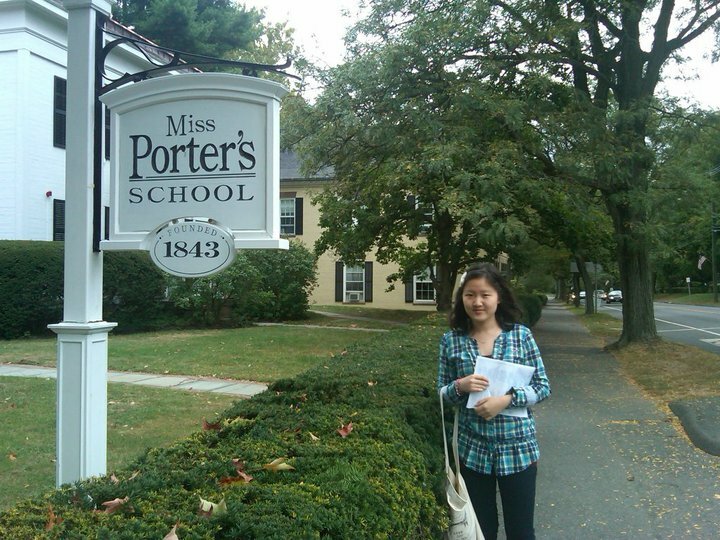 I came to America as an international student in 2010 and entered Miss Porter’s School, an all-girls high school in Connecticut. Unaware of the scope of the change, I was not nervous about the transition at first. I hopped on the plane with a light heart, yet the spontaneous tears during the plane ride revealed my underlying fear of moving to a new place for an unknown length of time. I could not articulate what I was going through, since I was only a timid 14-year-old who was not adept in identifying her thoughts. Without any expectations for the future or ideas about the person I would become, I started my life in the States with a naïve attitude. I started to struggle with identity and relationship after the excitement of novelty died down. My classmates started to find their niche, and they no longer asked my name or about where I was from. There were fewer topics to talk about, since I barely shared anything in common with the kids who grew up in the U.S. I had not watched the television shows, read the books, or visited the places they had been to. The day of graduation, with family, 2014. 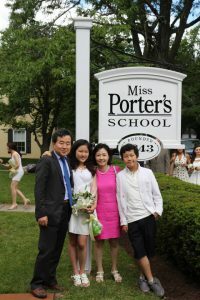 Miss Porter’s School had a special welcoming ceremony in which upperclassmen left a slip of paper on a shelf near the main entrance, assigning them whom to dress up as on the day of the ceremony. I unfolded my note, and the decorative words screamed, “Kim Kardashian.” Some girls who peeked at my paper burst into laughter, yet I did not know why it was funny — Who is Kim Kardashian? I thought. I did not ask, though, because I thought my ignorance would reveal my difference from them. My desire for connection led me to pretend that I understood cultural references and barely had language barriers. Ashamed of my difference, I focused on meeting people’s expectations instead of expressing and developing my own character. Little did I know that my insincere behavior suppressed my individuality, hindering genuine connections. I could not easily relax, but rather constantly tried to hide parts of me that I perceived as flaws. Through moments of loneliness and confusion during my five years in the U.S., I’ve learned how to teach and heal myself. Similar to the way Yoon passionately told me about her salvation through God, I now proudly tell people about the mindset I developed to survive. I’ve learned that when I dismiss the notion of a person I think I should be, I develop relationships more easily. Also, I need to cope with my sense of inferiority in order to overcome weaknesses and grow as a well-rounded person. Years after my encounter with her, I remember what I did not learn about Yoon, and my understanding of her deepens.